Ever Wonder About Wine Legs? Whether you’re enjoying a wine tasting tour on California’s Central Coast or relaxing on your sofa on a Sunday afternoon, if you’ve ever wondered about wine legs—those beautiful streaks that form on the sides of your wine glass after you give it a swirl—you’re not alone. In fact, wine legs are often a conversational topic among both novice and well-schooled wine lovers and while some wine drinkers may wax poetic about their meaning, there’s more science than mystery when it comes to deciphering their meaning. Not surprisingly, wine legs—or, as the French call them, wine tears, have a long history dating back several centuries and like any mysterious occurrence, it didn’t take long for the scientists to arrive on the scene in order to come up with a rational explanation. Wine legs are the result of a complex process that occurs between alcohol content, evaporation, and the surface tension between the alcohol and the water content in a wine. This effect was first noted by James Thomson in 1855 and later, the phenomenon was furthered studied by both the Italian scientist, Carlos Marangoni and J. Willard Gibbs for whose research the effect was named—The Marangoni-Gibbs Effect. And, while the wine romantics among us may want to believe that the weight and thickness of the legs can tell us the quality of a wine, there’s no supporting evidence to substantiate that claim. So if wine legs can’t tell us about the quality of wine, why bothering swirling? 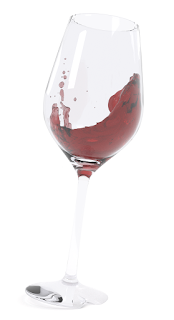 Swirling wine allows oxygen into the wine and helps to open the flavor profiles and nuances, which makes for a better wine tasting experience. And those legs? Molecules, droplets, and gravity aside, wine legs are an important part of enjoying wine, too, if for no other reason than their beauty. Savoring a glass of wine is an artful mix of the science of winemaking and an experience of the senses. So pour yourself a glass, give it a good swirl, and enjoy those legs.